My Grandmother’s no-chill pie doughis delicious, easy, and quick because you don’t need to chill it for a couple hours before rolling out! Sift the dry ingredients together. Using a fork or a pastry cutter, mix shortening in until dough is chunky. Take a liquid measuring cup. Add 1 egg (best if at room temp). Add cold water to egg until mixture measures 1/2 cup. Use cold water only as it helps bind dough and keep dough solid when handling. Mix Egg and water together with fork. Using a pastry cutter, mix together pie dough. Fork water and egg mixture into the dough. Kneed your dough together. I like to use an old pillow case I reserve only for baking purposes. It helps limit the handling as well as the mess! The pie dough recipe is enough for two pie crusts. Cut dough ball in half to prepare your crust. Roll out your dough on a floured surface. When your crust is the right size, roll dough around rolling pin and gently transfer dough to pie pan. Pat dough down into contours of pie pan. Use a piece of parchment paper sprinkled with flour, roll out pie dough. I like rolling on parchment because you can spin it around easy to change your angle and you can lift the edge of the paper to ease your dough onto your rolling pin when you need to move rolled dough into the pan. Parchment paper is not expensive and found at every grocery store. It has many other handy uses in the kitchen so is always good to have around. If you are making a crust top for your pie, repeat previous step to get your dough rolled out. Using a pastry brush, brush on egg mixture to help top and bottom crusts join. Once your top and bottom crust are together or if you only need a bottom crust: Cut off any excess pie dough around the edges, leaving about a half an inch for decorative pinching. Decoratively pinch to finish edges and make your crust very pie-like. Brush remaining egg mixture on pie crust and your pie is ready for oven. 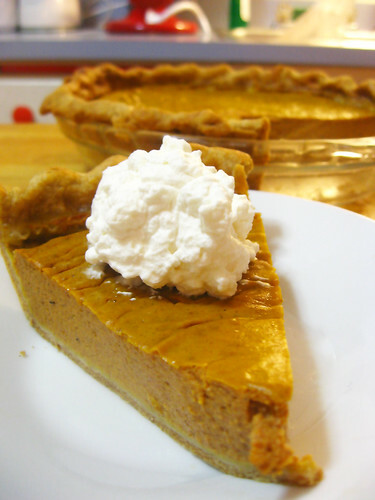 For your filling you can try this apple pie or this pumpkin pie.